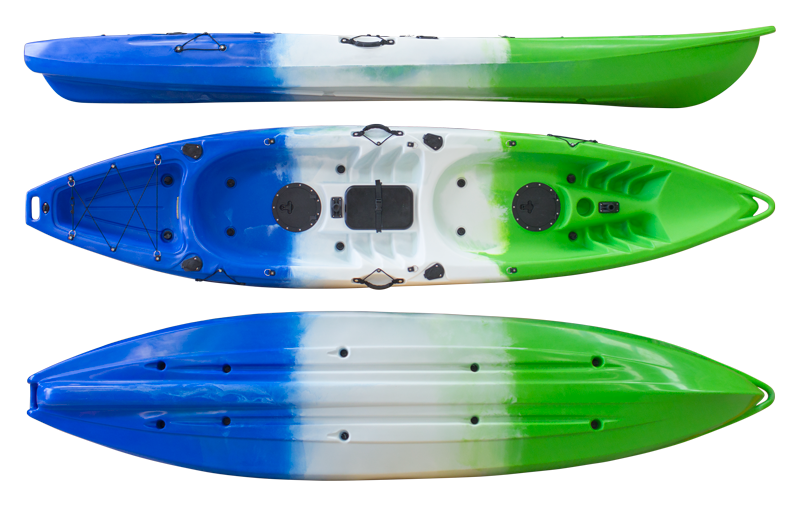 Based on the Unique Glide kayak the Glide Tandem is comfortable and stable with excellent glide. An ideal tandem kayak for fishing and family. With separate cockpits for each paddler, each having a 6 six diameter hatch, moulded foot rests, drainage scuppers and fishing rod holder mounting point. The front cockpit then contains a cup holder and the rear cockpit contains a moulded-in hatch with buckle lid closure. There are four flush mounted rod holders, two at the mid point and two at the rear. There is a storage well at the rear with integral bungee cord. Paddle retainers are fitted to keep your paddles safe. The rear keel and rails on the hull will keep the kayak stable whilst providing great straight line paddling. 6 x Fishing Rod Holders – 4 x Flush Mounted & 2 Central Adjustable. 2 x 6 inch Hatches with Liners – Liner is not Waterproof! 10 x Scupper Plug Holes – plugs provided, with easy pull handles for quick removal.